Manchester United and Celtic might be meeting in a competitive match for the first time on Wednesday night but their managers have a bitter rivalry that stretches back more than 20 years. United boss Sir Alex Ferguson has become famous for feuding with players, rival managers and even Irish billionaires during his illustrious career, yet his criticism of Celtic counterpart Gordon Strachan still stands out. "I decided this man could not be trusted an inch - I would not want to expose my back to him in a hurry," the 64-year-old Scot wrote of his countryman in his 1999 autobiography Managing My Life. In his own autobiography, My Life in Football, which was published earlier this year, Strachan admitted the comments "surprised and disappointed". He added: "It says much about the tension in our relationship, that even as a manager I have found it difficult to discount the possibility of Fergie taking a particular interest in putting one over on me." The Celtic boss went as far as to say he suspected Ferguson of fielding a weakened team against Derby in 2001 so that Strachan's Coventry were relegated from the Premiership. Strachan played under Ferguson at Aberdeen from 1978 to 1984 and says he thrived initially. "In the early days he was the manager who gave me the strongest platform for my ability, with the standard of the team he built at Aberdeen and his discipline and organisation," said Strachan. Yet the relationship suffered a terminal blow when Strachan signed a pre-contract agreement with Cologne weeks before the end of the 1983/1984 season. When Ferguson found out the midfielder had gone behind his back, he was apoplectic. "Though I always felt there was a cunning streak in Strachan, I had never imagined that he could pull such a stroke on me," he indignantly declared. Strachan actually decided to move to Manchester United in the summer - and was understandably less than thrilled when Ferguson followed him in November 1986. "When Fergie moved to United, I had to endure the big stick again," he said. Ferguson wrote "there was little evidence of the zest and cocky assurance that characterised Strachan's play in Scotland" and eventually sold the winger to Leeds in 1989. The veteran became an integral part of Howard Wilkinson's side at Elland Road and helped them win the 1990 Second Division title and then, at Manchester United's expense, the Division One crown in 1992. 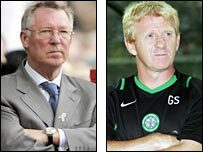 Relations between Ferguson and Strachan remained frosty following the latter's move into management but, significantly, they declared something of a truce following United's 3-0 pre-season friendly win over Celtic in Glasgow in July this year. That has led Strachan to declare: "All the history between me and Fergie is an irrelevance to Wednesday's game. "He sat in my office recently for 40 minutes and we laughed and joked and talked about football and the old days." Former Scotland international Gary McAllister has even gone so far as to tip Strachan to succeed Ferguson in the hot-seat at Old Trafford one day. It will be interesting to see if the new entente cordiale can survive the intensity of a Champions League match between arguably Britain's two best-supported sides on Wednesday.